Member Directory reports give you visit and click through statistics for your Business Directory members’ listings. A page view is recorded every time a member’s profile is accessed. A click through is counted each time a member’s website is accessed from their directory listing. You can view both aggregate directory and individual statistics. The Business Directory Report opens to area graphs showing total page view and click through counts for all of your directory members. The graphs are interactive and allow you view an individual day’s aggregate count, as well as change the date range. 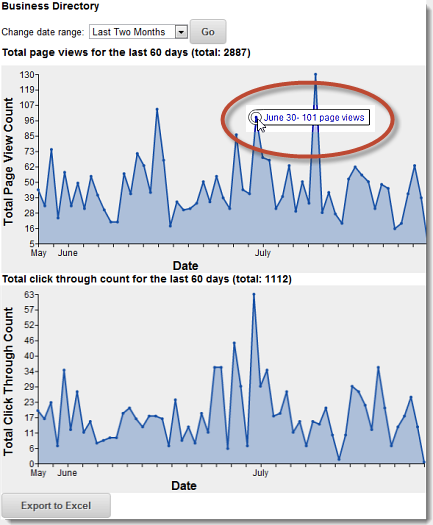 Position your cursor on a graph point to view the total page views or click throughs for the selected day. Click the Change Date Range menu, and choose a preset range. You can export total page view and click through data to Excel so it can be saved and used for analysis. To download data to Excel, click the Export to Excel button. Click a member’s link to drill down to view the member’s specific data. View individual day’s data by positioning your cursor on a graph point. Download the member’s page view and click through data to Excel so it can be saved and used for analysis by clicking the Export to Excel button.